The Boston branch of the NAACP gave Mayor Martin J. Walsh harsh grades in a review of his initial campaign promises surrounding race. 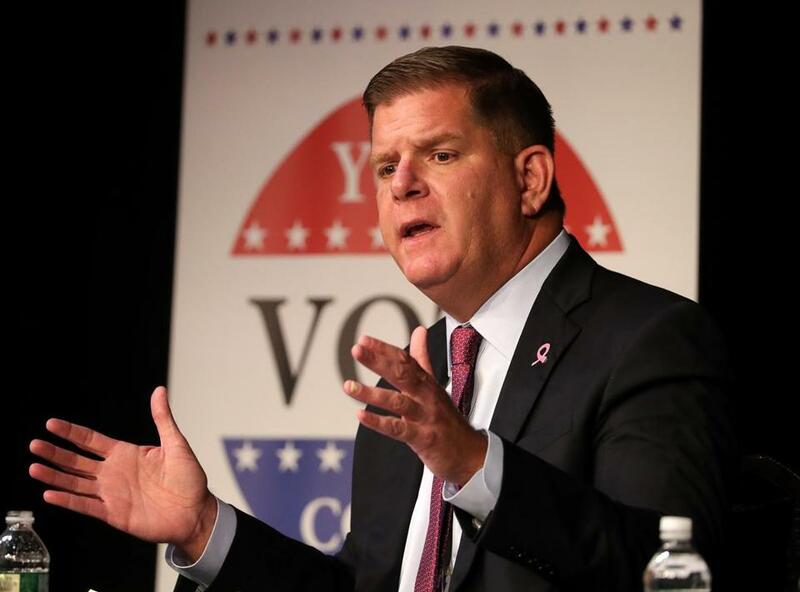 The Boston branch of the NAACP will release its first report card this week on the administration of Mayor Martin J. Walsh, harshly grading him on his ability to deliver on key campaign promises to communities of color. The nearly 200-page analysis, provided to the Globe, graded the mayor on his pledge to resolve vexing barriers for blacks and Hispanics in public safety, education, diversity at City Hall, and economic development. “While some of the outcomes are disappointing, we hold firm to the belief that we all want what is best for people in this city,” said Tanisha Sullivan, president of the local NAACP. She said the organization will continue to work alongside city and community leaders to address racial disparities and inequities. The mayor received no As. While the administration received Bs, Cs, and Ds in a number of areas, it got Fs for the lack of diversity in the Boston Fire Department (the city’s least diverse department); the recruitment and retention of teachers of color; and the city’s inability to fully implement the police body camera pilot initiative. The document — called “Equity, Opportunity, and Access Report Card: The Walsh Administration” — pointed to low levels of homeownership for building wealth among blacks and Latinos; high unemployment; high levels of poverty; and low levels of minority business development and success. More than half of Boston’s residents are people of color. “While there is always room for improvement, we are very proud of what we have been able to accomplish over the past four years,” he said, such as creating opportunities for minority- and women-owned businesses, building affordable housing, adding 700 pre-kindergarten seats, and expanding early learning opportunities. In the 2013 mayoral campaign, Walsh pledged in two debates that as mayor he would focus on issues of importance to communities of color. He called the difference between black and white rates of unemployment “unacceptable” and demanded a collective action to fix the disparity, the report said. He proposed several measures to expand affordable housing and support minority businesses. But his efforts have not been enough, the report said. The document, two years in the making, comes as Walsh, running for reelection against Councilor Tito Jackson, is seeking to shore up communities of color that helped elect him in 2013. This year’s election is Nov. 7. The NAACP, which promises more report cards in the future, took a hard look at the mayor and graded his administration’s efforts and results. Walsh administration officials noted the report contained inaccurate and inconsistent data, including the measurement of household income. But NAACP officials said they based their analysis solely on information they received from the city through public records requests, the city’s own reports, or news articles since the mayor took office through Dec. 30, 2016. The report said the grades do not acknowledge the “fullness of the work in progress” within communities of color. But it criticized the city for not providing some documents that the NAACP requested. The report gave the mayor a D overall — indicating “no real change” — on economic development for blacks and Hispanics since Walsh took office. While the mayor created numerous initiatives, the document said, is not clear what impact those efforts are having on communities of color. Unemployment is 4.9 percent for whites, 10.7 percent for blacks, and 10.9 percent for Hispanics, the report, based on 2014 data, said. The researchers said they asked for current data but did not receive it from the city. On affordable housing, the report said the city is not doing nearly enough. Just 2.3 percent of the 19,000 units of housing built or under construction by the end of December 2016 were affordable to people with very low income, said the report, according to the data it evaluated. The city said current housing numbers are higher: 9 percent of the 21,955 units permitted to date are for extremely low-income families; 9.5 percent for middle-income families; and another 22 percent are market rate and accessible to middle-income residents, officials said. But NAACP officials countered that nearly 60 percent of the housing are still not accessible to a majority of middle- and low-income families. On public education, the report gave the city an overall grade of C – for incremental improvements – and criticized the city for not fully funding city schools, being slow to expand high-quality pre-kindergarten seats, and not closing the opportunity achievement gap that haunts students of color. On public safety, the report heralded the establishment of the Social Justice Task Force and the revival of the police cadet program, which it said will help improve diversity. But the report gave the city an overall D, as it criticized the city for failing to strengthen the community ombudsman oversight panel, which reviews complaints against officers. While crime is down overall over the past 10 years, the report said, violence persists in specific communities. “The scores of unsolved homicides and shootings reflect the fact that community policing efforts still have a long way to go in order to gain the full trust of the community public safety officials serve,’’ the report said. On staffing diversity, the report said the city has not made significant “progress toward achieving reflective representation in its workforce” and gave the administration an overall grade of C.
City officials refuted most of the report’s grades and assessments, adding that the mayor has been tackling longstanding barriers to education, housing, and economic development in communities of color, with new initiatives such as free college tuition for city students. His economic development cabinet was created to combat income and wealth disparities, the officials said, and his new diversity officer aimed to change the hiring culture at City Hall. Officials said 42 percent of the new police hires are either black or Hispanic, and 37 percent of the city’s teachers are people of color. They added that school department’s $1 billion budget is the largest in city history, representing a nearly $50 million increase since last year and a $154 million hike since 2014, despite declining state and federal aid. For the first time, all three of the city’s exam schools are led by people of color.